The mural was designed and led by artist and Tara Dorey, assisted by Emily Harrison and five youth employed at Mural Routes for the summer mentorship program. The youth team were mentored throughout the summer to brainstorm the design, cut and sand panels, prime, and paint under the direction of lead artists. This bright coloured “rainbow” sunset was inspired by the youth’s input to celebrate diversity. The mural on plywood panel pieces spans three walls, and is located at Magnattude Hair Salon. 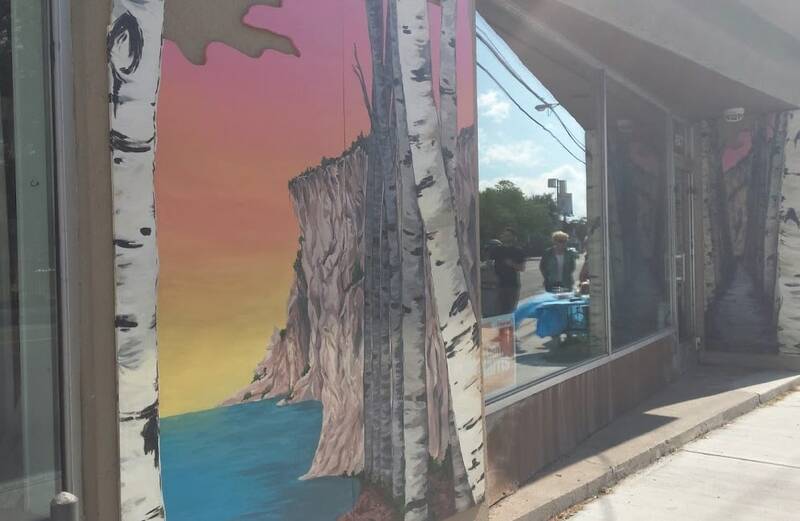 Birches at Sunset is a part of The Birch Cliff Community Mural Project. The project was initiated to improve the visual appearance of the arterial road that services their neighbourhood. By engaging with Mural Routes, the Birch Cliff Residents’ Mural Committee aims to have this project act as a catalyst for community engagement, reduce the impact of tagging and encourage businesses to take pride in their buildings and become part of a street improvement program. This mural was made possible by the City of Toronto Economic Development grant.